I cannot count how many times a day my iPhone has helped me when I’m in a pinch. I don’t even think I could accurately count if I tried because I take so much of it’s use for granted, from quick directions and recipes to accessing photos and emails. If you have a smartphone, you most likely know what I’m talking about. Only, that little handheld device is just one of the many blue screens we stare at everyday and many of us find it hard to detach. When this is the case, our bodies will often let us know; our focus gets fuzzy, our sleep schedule goes off kilter, or maybe our stress levels start to rise. Whatever it is, it’s important to listen to that voice and readjust. But what about our children? How much is too much? In the April 2018 issue of Sleep, a study was published about the association between depressive symptoms and four screen activities common among teenagers: social messaging, web surfing, TV/movies watching, and gaming. “The results show that extended periods of social messaging, web surfing and TV/movie watching increased insomnia symptoms and decreased sleep duration, which led to an increase in symptoms of depression” according to a US News and World Report article. “Additionally, greater amounts of each activity were associated with less sleep, leading to more depressive symptoms.” As screen time increases, one consequence leads to the next. In addition to sleep loss, some research has found connections to the brain’s reward pathways, the body’s stress hormones, and excitability. Brian Nolan, a guidance director at Andrew High School in Tinley Park, spoke out in the Chicago Tribune, not necessarily about depression, but about loneliness and social impacts. “My belief is that today’s technology never allows children to truly disengage from their social lives”, Nolan said. “The smart phone’s ability to connect us all immediately doesn’t allow that social interaction to ever be turned off. If they aren’t included they can feel lonely. If they are included, they can feel pressure to keep up.” It seems kind of ironic. Being able to connect with so many, yet feeling alone all at the same time. Data associated with this concern is shown in the graph below from an article in The Atlantic. 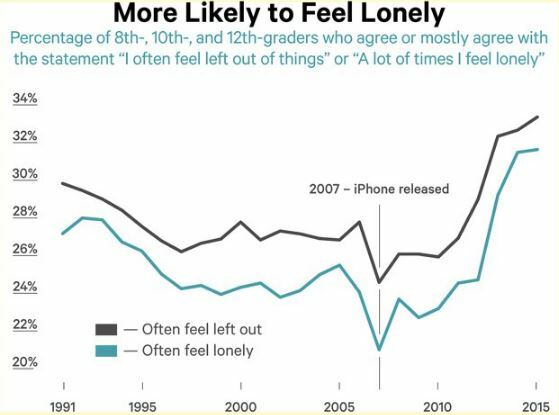 Beginning in 2013, the percent of teens who had feelings of loneliness increased. This doesn’t mean all teens who spend more time online are lonelier, but the feeling is more common as in-person interaction decreases and smartphone time increases. 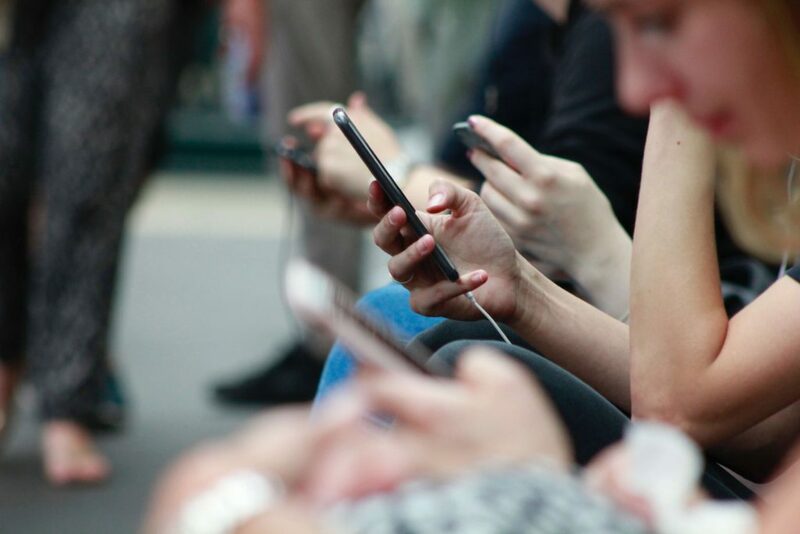 According to a Pew Research study, of the 95% of teens who have access to or own a smartphone, 45% admit they are on the device ‘almost constantly’. When looking at social media alone, teens in the Pew article were asked about it’s impact on their lives. “It makes it harder for people to socialize in real life, because they become accustomed to not interacting with people in person” said one teen. Another mentioned, “It provides a fake image of someone’s life. It sometimes makes me feel that their life is perfect when it is not.” These teens were among the 24% that said social media’s effect was mostly negative. To give you the full picture, 45% of teens said the effect was neither positive or negative, while 31% said the impact was mostly positive. Many of us don’t need numbers to give our opinion about smartphones, games, and tv time. Screens can be distracting, they can disrupt our sleep, interfere with our social lives, and get in the way of time spent doing whatever else we would be doing without that tablet, laptop, or iPhone. Sometimes, it seems like our technology can be a double edged sword – it’s not only the time spent on our devices, it’s the content our children are being exposed to and then how they cope with it. When looking at the other side of the argument, it would be unfair to say these devices don’t have their benefits. Our children deserve to evolve as our technology does that same. If you are a parent or educator, understanding how to keep the scale balanced is important. If you feel like the child or children in your life are spending too much time facing a screen, talk to your doctor about recommendations. We will try our best to keep you and your family up to date on the latest information. Worried about your child? Here is a quick test to see if your young one needs a technology time-out.